It is with deep regret that we learn of the passing of our friend and former player, Granville Hall, who died suddenly last Thursday, 3rd February 2011. Granville, often described as a well travelled defender / midfielder, joined East Antrim in 1981, having played as a schoolboy with N.I.Civil Service, where he returned after further learning his trade with Quuen’s University H.C.
After four successful seasons at "Service ", where his defensive strengths helped to keep the 1st XI in the top four throughout (actually winning Senior League II in 1978) he moved for a short spell to Annadale H.C. where he played in Junior League II for the ’Dale XI. During this time, however, he trained with East Antrim H.C. with the obvious move taking place in season 1981-1982 when he transferred across the City to the Glengormley based "Green Machine". During his time with East Antrim, Granville played on the 1st XI, being relegated to the Intermediate League in his first season, but returning to Section II immediately the next season (1982-1983) as League and Cup champions. 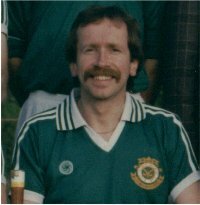 This was the golden age of Indoor Hockey and he was also a member of the East Antrim "Indoor Wizards" squad which consistently performed well above their outdoor status, winning Division II in 1985 and playing in the premier league until indoor hockey lost its popularity with the advent of plastic pitches. Granville moved closer to home when, in 1986, he followed coach Jim Carlisle to Collegians H.C, where he was a member of the 1st/2nd XI squad but a serious double-fracture of his right leg in 1992 finished his competitive playing career, although he returned to East Antrim as 1st XI coach for a short period to help them retain their senior status in 1994 and for thirteen years he also coached at Belfast Royal Academy, being responsible for many of his young proteges wearing the green of East Antrim over the years. Granville, during his playing career, was also heavily involved in the administration of the clubs where he played and he served with distinction on the Club Committee of East Antrim. Granville will be sadly missed by all who remember him and our thoughts are with his family and those friends closest to him.